In tropical countries, it is estimated that 25 million people are blind from preventable causes and of those, trachoma is the most important, contributing to approximately 4% of global blindness. 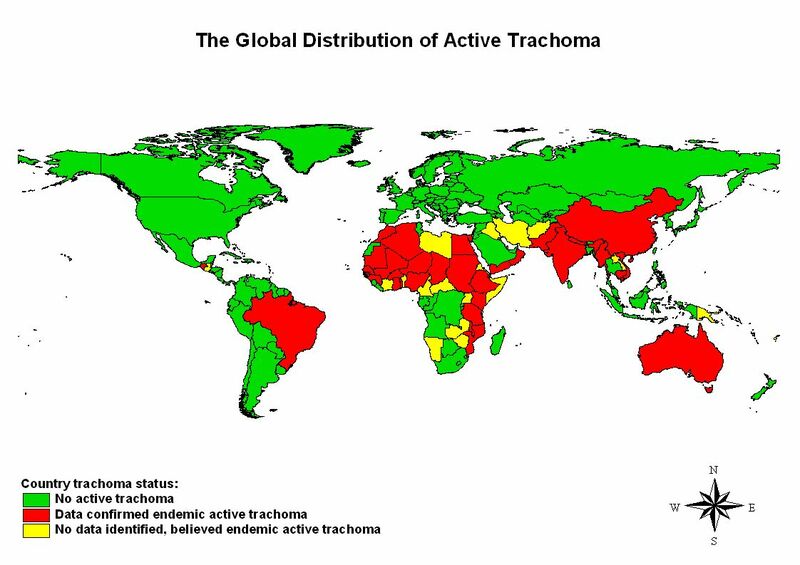 Trachoma is a very common chronic conjunctival infection caused by Chlamydia trachomatis, which is transmitted by flies or through close personal contact. (Note that the organism involved is C. trachomatis serotype A-C; C. trachomatis serotypes D-K are associated with genital infections and only occasionally cause a chronic follicular conjunctivitis that is clinically indistinguishable from trachoma). Xerophthalmia, due to lack of vitamin A in the diet. Onchocerciasis, or river blindness, an infection of the skin by filarial larvae that may also affect the conjunctiva of the eye. It was once endemic in most countries but now is confined to Africa, Asia, the Middle East and Aboriginal communities in Australia, as shown on the WHO map. There are an estimated 84 million people affected worldwide with 8 million visually impaired and 3.4 million blind. There is no racial predilection, only a predilection for poverty and poor personal hygiene. Women are affected 2 to 4 times as often as men but pre-school children of both genders are equally affected. In hyperendemic areas active disease is most common in pre-school children with prevalence rates as high as 60-90%, most commonly aged 3-5 years old. Where community prevalence decreases to around 20%, active disease is clearly seen to cluster in families. It is currently responsible for more than 3% of the world's blindness but the number keeps changing due to the effect of socio-economic development and current control programmes for this disease. Transmission is mostly between children and the women who care for them (disease of the crèche); this accounts for the higher prevalence in women. Blindness does not ensue until middle age: repeated episodes of infection cause chronic follicular conjunctival inflammation (active trachoma), leading on to the cicatricial stage of tarsal conjunctival scarring, entropion, trichiasis (in-turning of the eyelashes) which leads to corneal scarring and opacity. Follicular trachoma (Grade TF) produces active follicles on the upper tarsal conjunctiva. This phase of the disease is relatively asymptomatic. Trichiasis (Grade TT) is when eyelashes touch the globe causing fibrosis and corneal opacification. Some vision can be restored with successful correction of trichiasis. Corneal opacity (Grade CO) is defined as one that is easily visible and obscures at least part of the pupillary margin. Laboratory tests are not used in endemic areas where the clinical appearance is enough. Cell culture used to be the standard test but has been superseded by newer tests. In other areas, polymerase chain reaction (PCR) and ligase chain reaction (LCR) have high sensitivity and specificity. Another new test is direct fluorescein-labeled monoclonal antibody (DFA) and enzyme immunoassay (EIA) of conjunctival smears. Giemsa cytology (the finding of intracytoplasmic inclusions) is technically demanding, has a high specificity but low sensitivity. Eyelid surgery can prevent corneal scarring and blindness. As an interim to prevent entropion, double-sided sticking plaster has been used to good effect. Oral azithromycin (1 gm po or 20 mg/kg in children, stat then repeated every 6-12 months) is the antibiotic of choice and if a child is infected the whole family should be treated. Topical tetracycline and polymixin is as effective as oral azithromycin. The latter is a shorter course and associated with few side-effects (which are mild) but is more expensive (although large donation programmes are in place). Even a single dose of azithromycin causes a marked fall in prevalence and intensity of the disease in a mass programme and it was sustained for 2 years. A single dose of azithromycin is as effective as 6 weeks of topical tetracycline. Topical antibiotics are less useful long-term as C. trachomatis occurs in the oropharynx and patients may re-infect themselves. Mass treatment programmes of entire communities may be necessary where the prevalence in 1-9 year old children exceeds 10% but this has to be balanced with the possibility of antimicrobial resistance (not a problem to date). Community-based health promotion about facial cleansing and hygiene reduces the risk and severity of trachoma. Do not let flies walk over children's eyes. Environmental health involves personal hygiene as well as clean water and safe sewage disposal along with a reduction in flies. This SAFE approach has been shown to be successful in a number of countries. Researchers have highlighted the need to focus management on children in order to tackle the problem in its early stages. Appropriate treatment of early disease gives an excellent prognosis. Severe disease may be stabilised but vision may not improve. Re-infection worsens the prognosis. Mathew AA, Turner A, Taylor HR; Strategies to control trachoma. Drugs. 200969(8):953-70. doi: 10.2165/00003495-200969080-00002. Dawson CR, Schachter J, Sallam S, et al; A comparison of oral azithromycin with topical oxytetracycline/polymyxin for the treatment of trachoma in children. Clin Infect Dis. 1997 Mar24(3):363-8. Solomon AW, Holland MJ, Alexander ND, et al; Mass treatment with single-dose azithromycin for trachoma. N Engl J Med. 2004 Nov 4351(19):1962-71. Ray KJ, Lietman TM, Porco TC, et al; When can antibiotic treatments for trachoma be discontinued? Graduating communities in three african countries. PLoS Negl Trop Dis. 2009 Jun 163(6):e458. West S, Munoz B, Lynch M, et al; Impact of face-washing on trachoma in Kongwa, Tanzania. Lancet. 1995 Jan 21345(8943):155-8. Yayemain D, King JD, Debrah O, et al; Achieving trachoma control in Ghana after implementing the SAFE strategy. Trans R Soc Trop Med Hyg. 2009 Mar 13. Taylor HR; Elimination of blinding trachoma revolves around children. Lancet. 2009 Mar 28373(9669):1061-3.